Every spring and pin you need to complete or rebuild a 1911 Auto or Officers ACP. Fits standard and high-capacity frames. 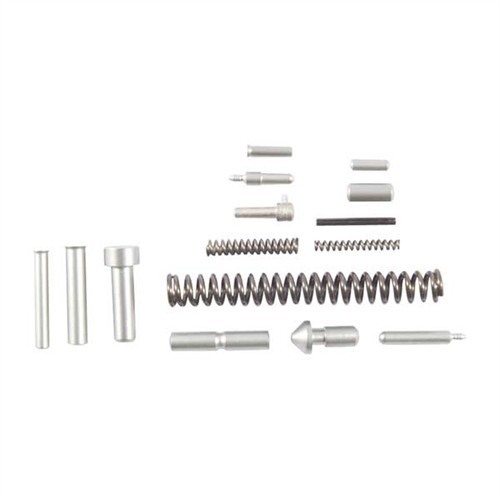 Kit includes one each: mainspring cap, mainspring housing pin retainer, hammer strut pin, hammer pin, sear pin, mainspring cap pin, magazine catch lock, safety lock plunger assembly, barrel link pin, ejector pin, mainspring housing pin, mainspring and magazine-catch spring. Hver vår og pin må du fullføre eller bygge en 1911 Auto eller offiserer ACP. Passer standard og høykapasitets rammer. Kit inneholder en hver: hovedkilden cap, hovedkilden pin holderen, hammer spankulere pin, hammer pin, svi pin, hovedkilden cap pin, magasin fangst lås, sikkerheten lås stempelet montering, fat link pin, ejektor pin, hovedkilden bolig pin, hovedkilden og magasin-catch våren. Bought this set to replace the original pins in a 1911 I was rebuilding. The sear/disconnector pin was a bit tight, otherwise no complaints at all. All working as they should. Used to repair customer's guns. I worked with an old time Gunsmith for a few years over 35 years ago in a popular Gun and Law Enforcement supply shop located in Philadelphia. He taught me how to do what I now do part-time. Most importantly, when trying to get parts from a major gun manufacturer without timely results, Bill said and I quote: "never use those guys for parts. always call Brownells for this stuff. They're good at what they do, have the parts, and stuff just gets here faster." That's it. And it's still the same. Thanks! Beautifully, high-luster stainless steel pin set. All pins smooth and uniform, dimensionally accurate. Quality springs included. Hands down better than Wilson Combat. Purchased this for a total rebuild of a Charles Daley. I duracoated in matte black and used all stainless parts for long durability and looks. this kit has every pin and spring needed to completely rebuild any 1911. The best part is that bought separately this would cost more and be easier to forget a part or two. great value from a great manufacturer. All parts fit perfect with little frustration getting the plunger pins on the plunger spring. Bought this since I needed a hammer pin that was closer to being flush to the frame since the ambi safety I installed did not sit on a grooved hammer pin like the factory safety. Hammer pin, sear and disconnector pin, MSH pin, plunger spring, slide stop plunger, safety catch plunger, and MSH components (pin retainer, spring, cap, and cap pin) all fit in perfectly into the frame of my Kimber Warrior. Used this to build an Ed Brown MSH for my Warrior which also fit perfectly (the stainless chainlink with lanyard loop). All the pins dropped in and it is within spec. Very useful part that I used to complete an STI frame. Ed Brown products to me are just like Wilson Combat, unsurpassed in quality, fit & function. Never had issues with either supplier. Excellent quality I've come to expect from Ed Brown. Pins are perfect and the springs are on par with Wolff's great quality. and the springs are also made to spec. Produsentnr. : 814S 800732814049 Hver vår og pin må du fullføre eller bygge en 1911 Auto eller offiserer ACP. Passer standard og høykapasitets rammer. Kit inneholder en hver: hovedkilden cap, hovedkilden pin holderen, hammer spankulere pin, hammer pin, svi pin, hovedkilden cap pin, magasin fangst lås, sikkerheten lås stempelet montering, fat link pin, ejektor pin, hovedkilden bolig pin, hovedkilden og magasin-catch våren. Produsentnr. : 814 800732814001 Hver vår og pin må du fullføre eller bygge en 1911 Auto eller offiserer ACP. Passer standard og høykapasitets rammer. Kit inneholder en hver: hovedkilden cap, hovedkilden pin holderen, hammer spankulere pin, hammer pin, svi pin, hovedkilden cap pin, magasin fangst lås, sikkerheten lås stempelet montering, fat link pin, ejektor pin, hovedkilden bolig pin, hovedkilden og magasin-catch våren. Produsentnr. : 814OF 800732814025 Hver vår og pin må du fullføre eller bygge en 1911 Auto eller offiserer ACP. Passer standard og høykapasitets rammer. Kit inneholder en hver: hovedkilden cap, hovedkilden pin holderen, hammer spankulere pin, hammer pin, svi pin, hovedkilden cap pin, magasin fangst lås, sikkerheten lås stempelet montering, fat link pin, ejektor pin, hovedkilden bolig pin, hovedkilden og magasin-catch våren. Produsentnr. : 8140FS 800732814032 Hver vår og pin må du fullføre eller bygge en 1911 Auto eller offiserer ACP. Passer standard og høykapasitets rammer. Kit inneholder en hver: hovedkilden cap, hovedkilden pin holderen, hammer spankulere pin, hammer pin, svi pin, hovedkilden cap pin, magasin fangst lås, sikkerheten lås stempelet montering, fat link pin, ejektor pin, hovedkilden bolig pin, hovedkilden og magasin-catch våren.